In the 80s the Stephen King adaptation was practically its own genre. There were over a dozen Stephen King films stuffed into one decade ranging from diverse titles like “The Shining” and “Christine” to “Stand by Me” and “Pet Sematary.” And I’m not even including all those TV movies like 1990’s “It.” But like all fads they eventually fade. There have been some here and there like the utterly miscalculated “Dreamcatcher” and some bright spots like “The Mist” and “1408.” And now we have the extremely popular “It;” its first time being adapted for the big screen. With the popularity of nostalgic successes like Netflix’s “Stranger Things” and a surprise recent surge in quality studio horror films, the new big screen “It” improves immensely on the well-respected but sluggish 90s TV mini-series. The filmmakers aren’t clowning around; it’s an intense flick and features appealing characters brought to life by charming kid actors, imaginative direction, and an amusingly wicked performance at its center. Clowns. They're terrifying. Or at least a certain segment of the population thinks so. That's probably why so many people remember the 1990 TV adaption of Stephen King's popular novel “It” as being particularly frightening. Let's all admit the truth. The film is somewhat of a slog and most people probably just remember the 20 or so creepy minutes Tim Curry appears on screen as Pennywise the Dancing Clown. Now, finally, director Andy Muschietti has brought Pennywise to the big screen where he deserves to be. And what a fun roller coaster ride the film is. This epic horror flick follows a group of prepubescent friends as they deal with typical teenage things like bullies and an evil being that takes the form of their worst fears, which is mostly a creepy clown. It is Pennywise and here he's played with charming, horrific glee by Bill Skarsgård. The story centers around young Bill (Jaeden Lieberher) after his younger brother Georgie goes missing. Apparently the small town of Derry, Maine has a terrible history of tragedy and death, which includes lots of missing children. All of Bill's friends have been seeing a creepy clown and other frightening manifestations. There's Stranger Things' Finn Wolfhard as the smart-mouthed Richie, portly new kid on the block Ben (Jeremy Ray Taylor), home-schooled outcast Mike (Chosen Jacobs), hypochondriac Eddie (Jack Dylan Grazer), the Jewish kid Wyatt (Stanley Uris), and the girl of the group Beverly (Sophia Lillis). Every one of these young actors bring their fully formed characters to life. Truly outstanding performances all around. You're instantly are on their side and are easy to identify with. 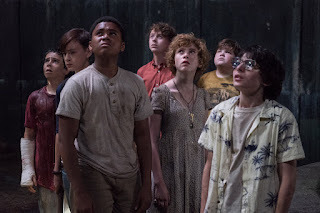 Focusing solely on the kids' traumatic experiences dealing with this scary monster sort of makes the film feel like a creepy (and profane) version of “The Goonies.” The film's witty script (from True Detective's Cary Fukunaga, Annabelle's Gary Dauberman, and Chase Palmer) focuses just as much on humor and heart as it does on frights. Humor and fear has always gone together hand and hand and Muschietti finds a surprisingly successful balance. The film goes to some truly dark places, but you'll laugh just as much as you'll jump. The frights are brought to the screen with fantastic effects and some truly creepy imagery. The R-rated film also has enough tense moments to give the most seasoned horror fans a jolt (my favorite being the tense Nightmare on Elm Street-like sequence involving hair, a sink drain, and lots of blood). It helps that you really like these kids and watching them in peril is a stressful experience.